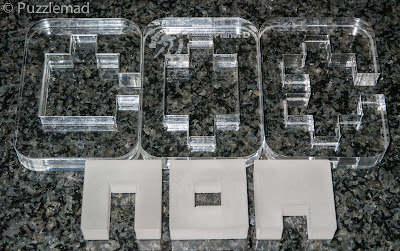 A mechanical puzzle blog from a grown man who should know better!! You all know how much I lurve my wooden toys (in fact just have a look at the latest post on my New additions page to see just how much I lurve wood) but sometimes a craftsman produces something (or several somethings) made from acrylic and I just cannot resist. Actually you know I struggle to resist any new puzzles no matter what they are made of. Just before the Paris IPP we were joined by the brilliant Brian Young (MrPuzzle himself) in Birmingham for one of our MPP gatherings. Brian was showing off quite a few new and old toys (including the fantastic sequential discovery puzzle, the Louvre which kept me occupied for a VERY long time - still available here). He roamed the room chatting and solving things before finally putting us out of our misery and opening his suitcase of goodies that he had brought from Oz. We all pounced like a pack of starving hyenas and I left the MPP later that evening with quite a nice stash of toys and the knowledge that I would still have some (not enough) cash left for the IPP itself. One of the toys I brought home was the Dwarf Planet D which is a 3 piece board burr with what looks like a captive cube inside (I had seen this before at Allard's house and decided at that time that if possible I should get one. 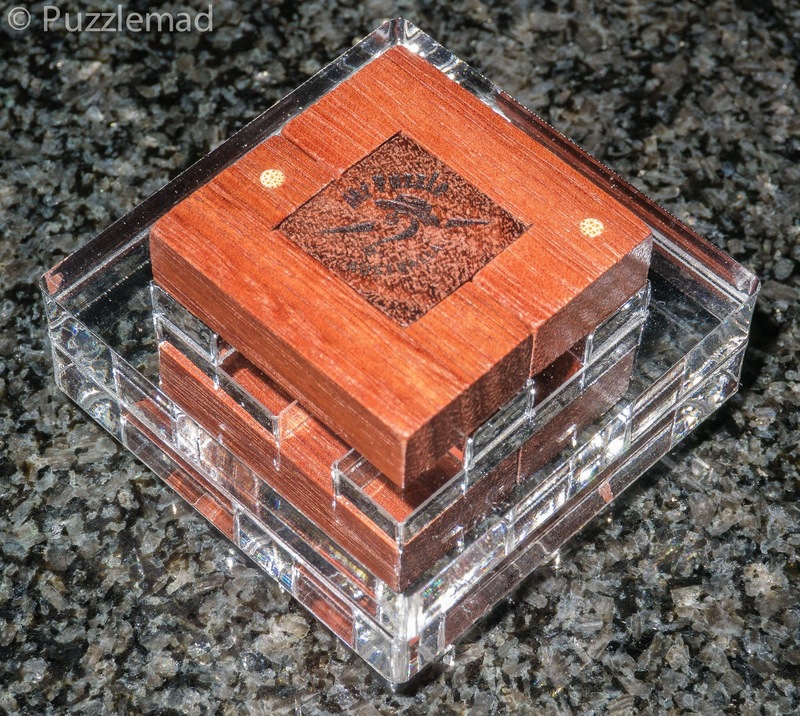 This puzzle was designed by the incredibly talented William Hu and was the exchange puzzle given out by Jerry Slocum at the IPP in Japan in 2016 (the reason I saw it at Allard's). There's actually 6 pieces in it! After my surprise at seeing the cube was 3 smaller pieces, I just put them all away in a cloth bag and left them for a week to give my sieve like brain a chance to forget the whole thing. It is only level 6-8-2-3-3 so I figured that it shouldn't take me too long. WRONG!!!! I think I worked on this for a week before I finally got it back together - either this is pretty tough or I am really REALLY bad at assembly puzzles. I'll let you choose which of those is correct. At various times in the evenings in late July, Mrs S actually wondered whether I was having a heart attack! There was so much muttering and groaning going on from my chair in the living room! When I finally got it back together again, I shouted aloud and further upset "she who must be plactated with shoes and handbags". I should not have been surprised at my failure - apparently there are 69 false assemblies and only one possible solution. 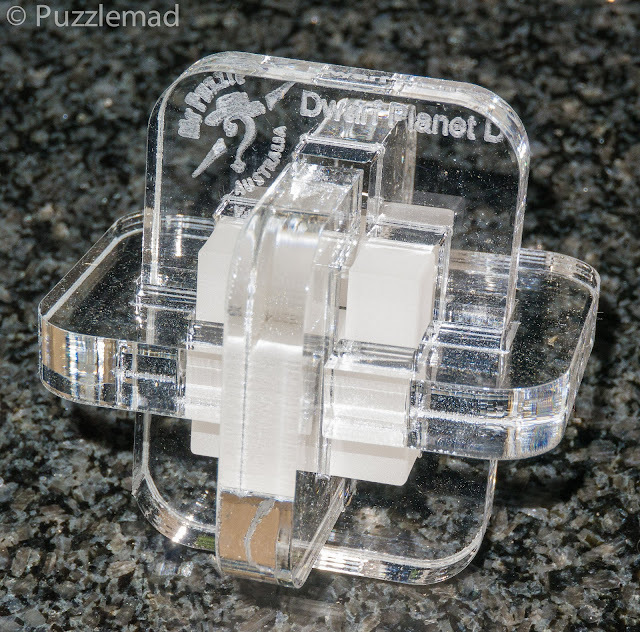 The Dwarf Planet D may only be Acrylic and only be 6 pieces but it is a terrific puzzle when approached as an assembly. It also is surprisingly cheap and still available to purchase from Brian and Sue's wonderful store. Go get one now and have someone else disassemble it for you first. Then be prepared for a fabulous challenge! Another puzzle which I bought from Brian at that MPP was the Pulsar burr by the incredible Junichi Yananose (his blog is here and puzzle store is here - run by him and his wonderful wife, Yukari). This puzzle was the exchange from Lambert Bright at the 2015 IPP in Ottawa. I was originally not going to buy it because partly it was only acrylic and also it was an assembly puzzle (sold as a pack of pieces) which I acknowledge freely that I cannot seem to cope with. Again at the suggestion of Ali (I sometimes think he doesn't like me much!) I was convinced that I should buy this one too and it was added to my pile o' puzzles. This one was then taken home and put on my shelf of stuff to be played with and then forgotten about during IPP. After that I kept picking it up in the packaging and then shying away and putting it down again - yes, I am THAT bad and frightened of them! This puzzle has a photo of the finished shape on the packaging but even with that I was too frightened of it! Finally I saw a photo the completed puzzle amongst the collection of my good friend and fellow moderator of the Facebook Puzzle Photography group, John Haché (blog here). After mentioning that I had still not solved mine, John sort of goaded me into giving it a try. 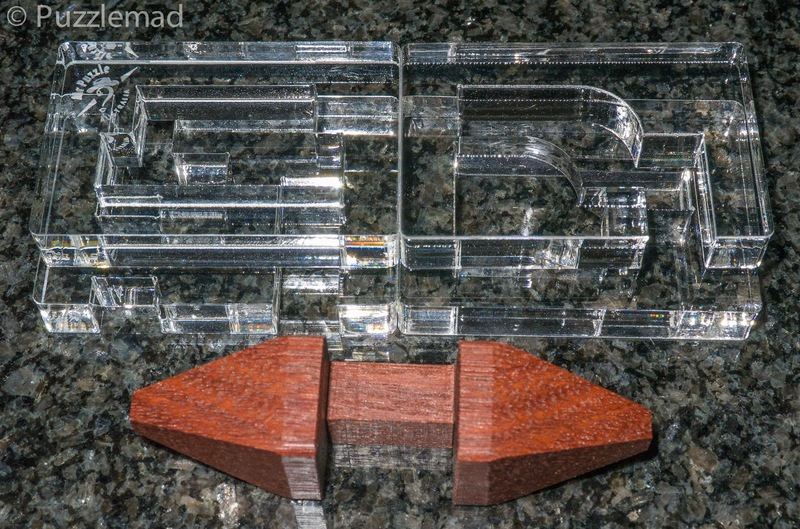 "The puzzle consists of 4 pieces of 10mm acrylic and a single wooden piece from Western Australian Jarrah. One of the acrylic pieces is quite unique to any other burr we’ve ever made. Junichi designed it with a sweeping curve cut out of the piece. This is a very doable puzzle from someone who’s had a little experience assembling burrs. But it is designed by Junichi so it’s not a pushover that’s for sure!" Well, I guess I am an experienced burr solver but not assembler. There seems to be a few possible orientations of the boards but the ones pierced by the stick are pretty obvious with a little thought. After that a little experimenting is required and you quickly discover that the "sweeping curve" provides some really lovely moves. As is usual, the first few attempts trying out the more obvious assemblies just won't work. After about 30 minutes I began to take John's name in vain and put it down to stare at it and Think©. Unusually for me this actually worked! There is nothing unexpected about the solution of this puzzle, no rotations, no tricky moves, but the order and positioning to assemble this one is entirely unexpected. In the end after about 45 minutes I had it assembled and congratulated myself on taking John's advice - this is a really clever puzzle too. It is easier than the Dwarf Planet D but just as much fun. In fact, I would suggest that this is perfect for both novice and experienced puzzlers alike. Perfect despite being acrylic! "There are so many peculiar moves due to the rotations that it even makes it difficult to know exactly what disassembly level to classify this burr as. The printed solution has been draw with 61 steps. The puzzle requires rotational moves, so BurrTools can't help you much with this one! No force at all is required to rotate the pieces; everything just needs to be lined up just right so you’re ready to make the move. Sold assembled. It would be way too difficult if we sold it apart. Even though we sell this puzzle assembled we still don't think that many people will ever take it apart and reassemble it again without the aid of the solution or a computer." I get the distinct feeling that this one is rather difficult!!! I have played with it intermittently ever since I got it and am sort of ashamed to have to admit that I have not really got very far! Initially there are not very many moves possible but as you work your way in there are more and more possibilities and most seem to end up at a dead end. Except there may be rotational moves at the dead end and I haven't noticed. I have done several rotational moves but they don't seem to help. I think I am about 20 moves in and that is it. It's back on the shelf just now and maybe I will try again soon - when I have finished with my recent new purchases. Unfortunately this one has now sold out. If enough of you pester him then maybe you can convince Brian to make some more? Now I really must solve something or I will very soon be running out of stuff to write about. I just don't seem to get the time to solve much recently. Hooked on puzzles. My mission is to torture my friends and colleagues with mind-bending puzzles at every opportunity! Parity is to be understood not feared! Breakdown, a broken banjo bolt, and glue everywhere.